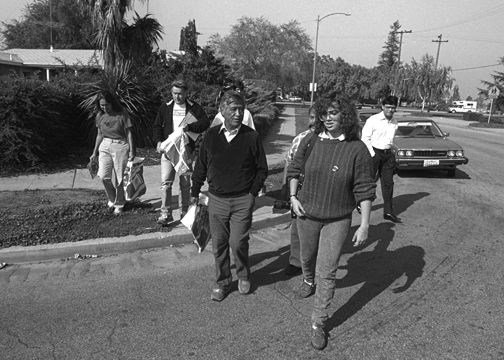 UFW Stories: "Going door to door talking to supporters about the grape boycott with Cesar, Dolores & Martin Sheen"
"Going door to door talking to supporters about the grape boycott with Cesar, Dolores & Martin Sheen"
I’m a child of an activist, so can’t remember when I first met Cesar. Just know the UFW has always been a major part of my life. I remember marching as a toddler in front of a local supermarket waving my UFW flag, during the grape boycott. I got involved with the UFW again as part of a college project and joined staff soon after. I was lucky enough to call Cesar a good friend and mentor and had many wonderful experiences with him. This photo was taken around 20 years ago, shortly after I joined staff and came to CA. Was taken during a boycott grapes event where we went door to door telling people about the grape boycott. As our press person, I was walking in a delegation with Cesar Chavez, Dolores Huerta and Martin Sheen. Good memories.